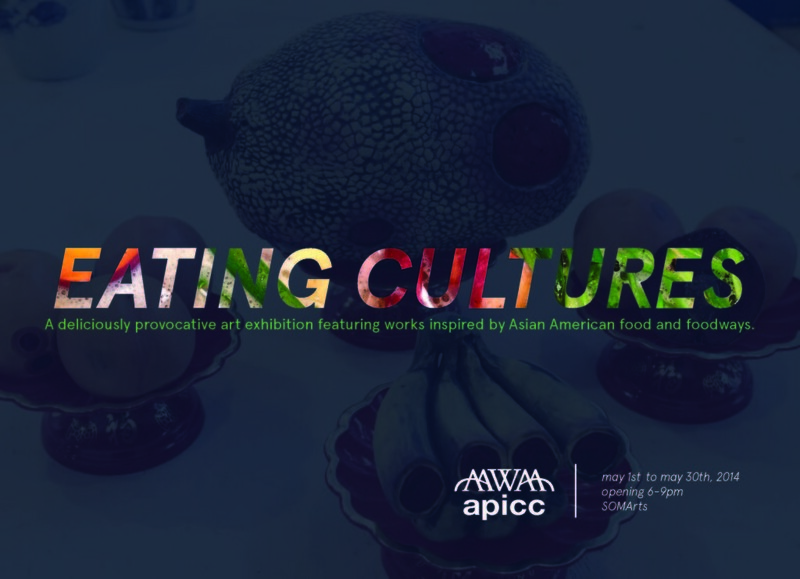 As we close out this year’s AAPI Heritage Month, I invite you to check out this really phenomenal multi-disciplinary exhibit in San Francisco — “Eating Cultures” — which was organized by the Asian Pacific Islander Cutural Center 17th annual United States of Asian America Festival, and the Asian American Women Artist Association. “Eating Cultures” is having it’s closing reception today at 6-9pm at the SOMArts Cultural Center, 934 Brannan Street, featuring music and a wonderful potluck! It is free and open to the public, but please try to RSVP on Facebook! Recently, I decided to participate in the Meatless Monday campaign for a number of reasons (including, but not limited, to GOP stupid). Having never done anything that could be even remotely construed as “vegetarian” before in my life, these posts will document my adventure into Monday Meatless-ness. Today, I learned that people add meat to things that have no business having meat added to them. It's hard out here for the meatless. Today is my first Monday of meatless-ness. Over the weekend, I was strangely giddy about embarking on this adventure; I found myself mentally planning the dinner for tonight. Unfortunately, I failed to make any considerations for lunch, and having failed to go grocery shopping over the weekend, I opened the fridge this morning (while I was running late) and realized that my only lunch options (meatless or otherwise) was a peanut butter and jelly sandwich. Bleagh. So, I decided to buy lunch. My building contains a single food option (other than vending machines): a somewhat over-priced gourmet cafe on the first floor that sells a potpourri of decent meals, from fresh sandwiches and entrees to pre-packaged “sides”. Everything at this cafe is gigantic, and priced to reflect the gargantuan portion sizes; one can easily spend over $10 for a sandwich and drink (and have food enough for an afternoon snack). Today, I went down to the lobby and was greeted with the sign proclaiming that their soup of the day was corn chowder (my favourite soup). I was thrilled — what a perfect way to kick-off Meatless Monday! — until I saw the fine print. Corn chowder… with shrimp and bacon. What? WHAT? Shrimp and bacon? 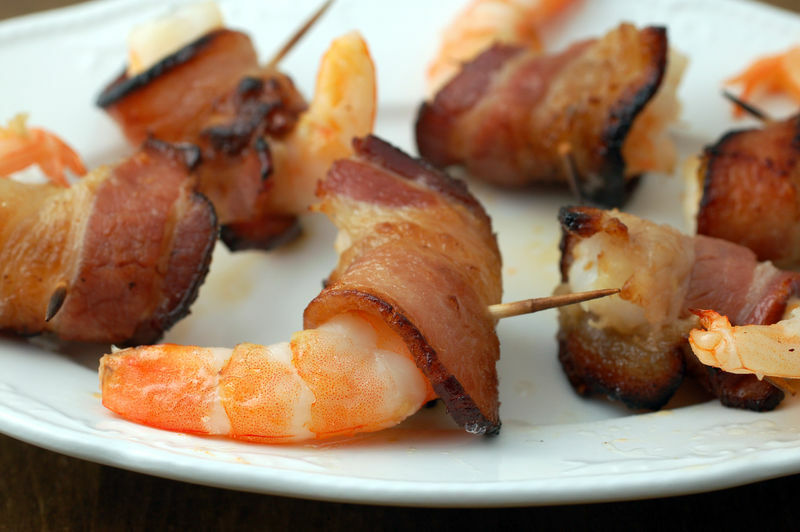 Bacon-wrapped shrimp is one of the nectar of the gods. It's also completely unnecessary in corn chowder. I was immediately struck by a couple of thoughts: 1) boo, I can’t have corn chowder, and 2) how and why would someone feel the need to add meat to an already delicious soup style? 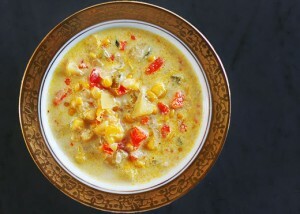 The taste of those extra meaty bits would be virtually lost in the naturally strong flavour of corn chowder. Perhaps I had never fully appreciated it before, but the addition of meat to this soup seemed totally superfluous. And that, right there, is the theme for today’s lunch. Disappointed by the soup posting, I perused the pre-packaged food options (it takes forever for these folks to put a sandwich together, and I wasn’t about to brave the lunch rush) and saw a number of delicious options. All looked tasty! 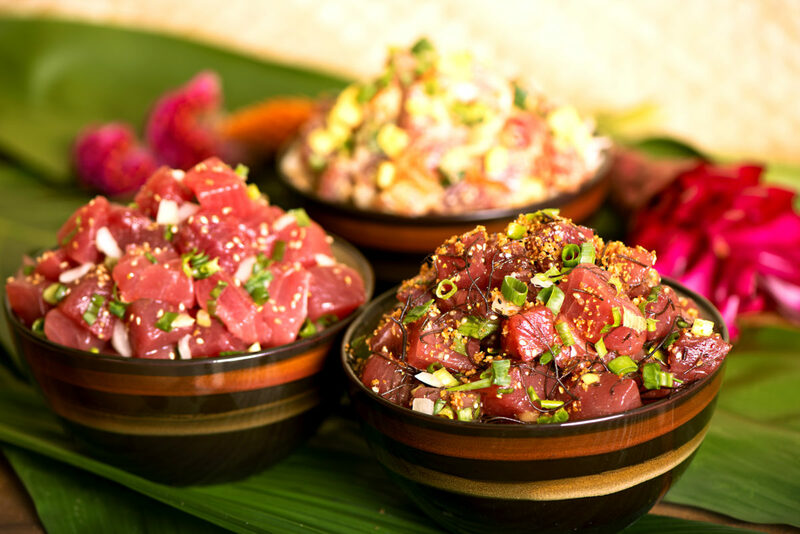 And– all of them contained meat. Tuna salad, potato salad with bits of bacon, Caeser salads containing bits of grilled chicken, wraps containing a variety of deli meats, tomato salads containing little flecks of ham or turkey or something. Even all of the full-course microwavable entrees were chock full of meats: penne carbonara, meatloaf, some sort of meatballs and gravy. I had no idea it could be so difficult to find a vegetarian option! I also had no idea how pervasive meat was; meals that have no business having meat thrown into them were suddenly meat-ified. I couldn’t help but think of that corn chowder, disappointed that some enterprising cook thought “everything’s better with meat” while throwing in superfluous bits of shrimp and bacon, and in so doing limiting any real vegetarian options. I couldn’t help thinking of earlier this month, when one of my vegetarian friends joined us for some dim sum in Chinatown. “It’ll be fine!” we assured him, before discovering that everything (even the turnip cakes) contained little meat bits. In the end he was forced to eat lukewarm stalks of steamed Chinese broccoli while the rest of us apologetically gorged ourselves. Today, I felt his pain. I finally settled on a (delicious) tri-colour rotini pesto pasta salad (the total package comes to about 1 cup’s worth of salad) with chickpeas and bits of olives and tomatoes; it was either that or a big thing of potato salad, which looked like a dense carb bomb with a side of mayonnaise. I supplemented with a small bag of baked chips and a diet soda. At the register, I looked over my pasta salad thriceways — and even shook it a little — to ensure no little bits of meat were floating in the pesto. I ended up satisfied with my inaugural Meatless Monday meal, and also discovered a new-found appreciation for America’s strange addiction to meat. We seem to add it to everything, and for no apparent reason whatsoever. No wonder obesity is an epidemic in this country.